Mangudi a remote village lies in Pudukkottai-Annavasal route(1) and about 14kms from Pudukkottai. The hillock in which the rock cut cave is scooped lies on the outskirts of the village. It is a short and narrow hillock stretching few yards in north-south direction. The southern side of the hillock is broad and thick whereas on the northern side it slopes down and ends like a tail. The rock cut cave is scooped in the southern end on its eastern precipice. 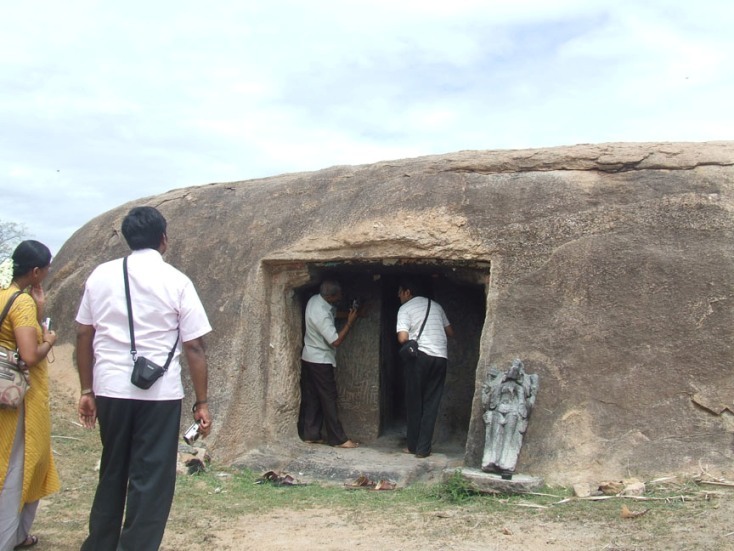 The rock cut cave is on the south western part of the Pudukkottai region known only by the name of the village where it lies. 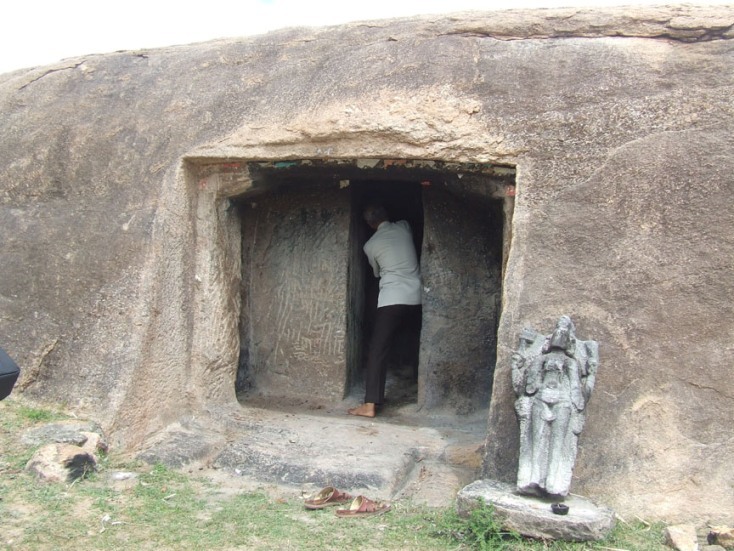 Usually petite caves are cellar type but Mangudi rock cut cave is a miniature mandapa type of cave. It consists of a facade, a mukha mandapa and a sanctum scooped to a height of .10 mts from the ground level. The facade is .39mts in east-west, 1.95mts in the north-south and 1.96mts height. It has brahmakanta pilasters at the corners and the potikas above the pilasters are rough curvy formation which bears the uttira above. The facade has rock cut extension of floor, roof and side walls. The floor extension in front of the faவூade is uneven formation and the side walls are .83mts in the north, .81mts in the south and tapering upwards forming a shallow kapota to the faவூade. The kapota is ranging between .14-.23mts. The canopy is flat. The facade is followed by the mukha mandapa which is .44mts in the east-west, 2.25mts in the north-south directions with the height of 1.67mts. The floor, roof and the southern wall of the mukha mandapa are well formed whereas the northern wall remains unfinished. In the western wall of the mandapa an aperture is formed to a height of 1.65mts and to a width of .56mts as opening to the sanctum. Usually differentiation is followed in the flooring level of the sanctum, i.e., sanctum will be little higher in level than the mandapa and almost cubical particularly for the Saivite caves. But Mangudi is peculiar where no clear demarcation is followed for the sanctum and the mandapa flooring. The sanctum is .60mts in the east-west, 1.22mts in the north-south and to a height of 1.63mts. The sanctum houses bas-relief Ganesa inside an arched niche on its back wall2. The niche is .76mts high from the sanctum floor with the breadth and height of .54mts and to a depth of .07mts. The deity is seated in maharajalilasana, head decorated as karandamakuta and back hands carry angusa in the right and pasa in the left whereas the objects in the front hands are not clear, might be motaka. The proboscis is left turn and on the front left hand. The cave is incomplete and a peculiar formation. The cracks seen in the sanctum roof suggests it’s incompatibility for further extension. There is no inscriptional evidence or any uniqueness in architecture to prove the period or author of the cave. 1. Field visit on 13-06-2010. 2. 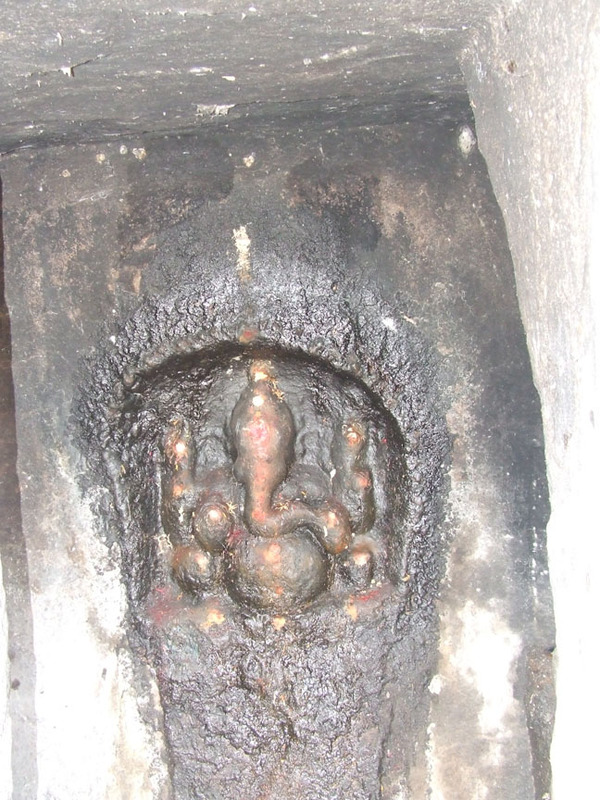 Rajamohamad J., Avanam 19, Pudukkottai Mavatta Kudaivaraik Koilgal, 2008, according to the author the deity in the sanctum back wall might be of later addition.